Sherman Peak and the southern Kern Plateau. 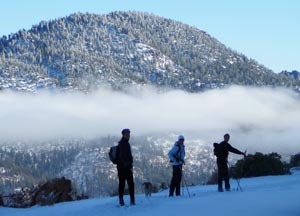 Winter recreation is almost unlimited in the Southern Sierra. Its one of the only places in the entire world where you can ski powder, kayak waterfalls, mountain bike epic singletrack, rock climb, and even kiteboard on the same day. The closest lift-accessed snow, is only 10 miles from the Lake. 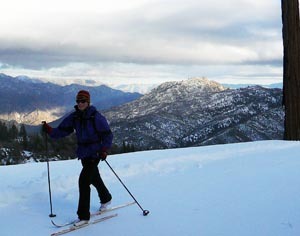 The Alta Sierra Ski Resort is up in the Greenhorn Mountains above Wofford Heights. It caters primarily to beginner and intermediate skiers and snowboarders, and is very popular with families. 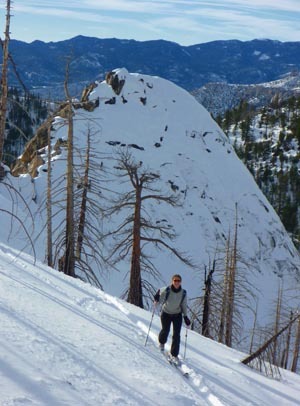 Nearby, backcountry skiers and snowboarders seek out the powder stashes, while cross country skiers and snowshoers explore the mountains. 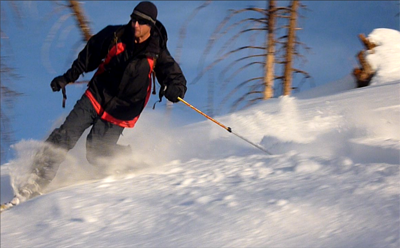 Carving ultra light powder near Sherman Pass. 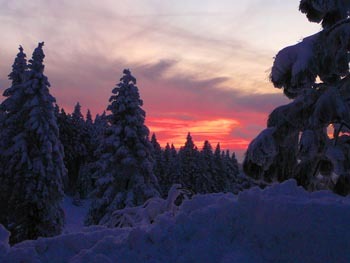 A Greenhorn sunset at Alta Sierra Ski Resort. 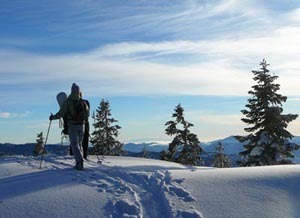 Snowshoeing up to a secret forested powder stash. The Greenhorns have some of the closest powder to town. You'll want to get it quick before the sun hits it! 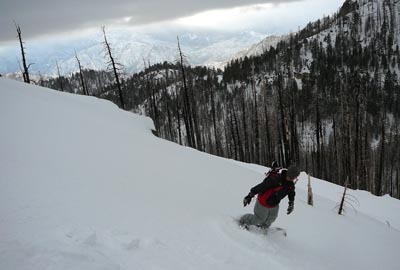 The area near Alta Sierra Ski Resort has some nice tree skiing, while further north towards Portuguese Pass sometimes has double the snow. Snowmobilers access the area via Hwy 155 and take the sometimes-groomed Portuguese Pass Road. Commencing at the Sand Shed at Greenhorn Pass, this route cuts across the Greenhorns north to Johnsondale, and continues to Ponderosa and Quaking Aspen. Another access point is near Sugarloaf on the west side, above Posey. 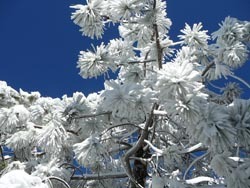 At 9,000 - 10,000 feet in elevation, the Sherman Pass Area gets a lot of powder. In peak winter months, one can ski almost anywhere above 8,000 feet, especially if you have a snowmobile. Summitting a peak somewhere past Sherman Pass. This area, part of the Kern Plateau, is accessed from the East near Kennedy Meadows, or from Kernville via Sherman Pass Road. An evening of tracking up Spirit Bowl. If driving from Kernville, take Sierra Way/Mtn Hwy 99 north 19 miles, turn right and drive up Sherman Pass Road until you hit snow. The lower portion of the road is plowed, while the higher section is now usually groomed. Earning turns. Skinning up on tele skis. A storm rider shred session up on the Kern Plateau. Another great source of powder is near Jordan Peak, out of Camp Nelson and Springville. Some of the roads are groomed, its popular with snowmobilers. And there's always the Piutes too! Write-ups on some of the backcountry options are on Sierra Sojourner blog, and Southern Sierra Outdoors blog. The best way to experience the Trail of 100 Giants. 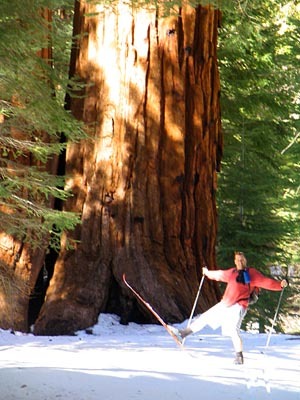 Spring xc skiing in the Giant Sequoias. 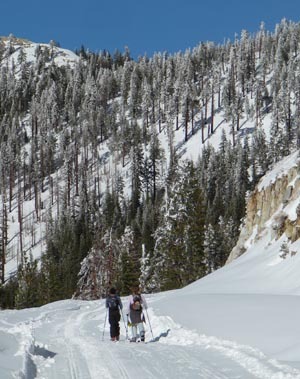 XC Skiing on Sherman Pass Road. In the Greenhorns, one of the most popular spots to cross country ski is from the Sand Shed at Greenhorn Summit. Portuguese Pass Road and the dirt roads around Unal Trail are also excellent options. If you are coming from the west-side, the Sugarloaf area has good access. 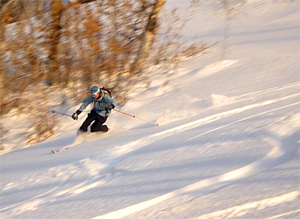 An afternoon ski near Greenhorn Summit. Further north, Sherman Pass Pass Road provides a scenic workout. It is usually plowed past Cherry Hill Road to the parking at Sherman Pass 4x4 Road, or beyond. 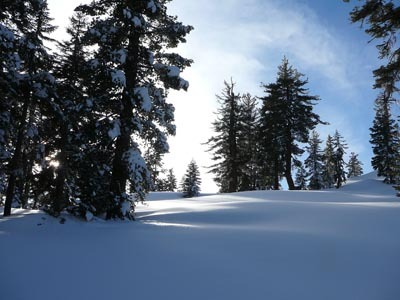 The USFS is now grooming all the snowmobile trails on the Kern Plateau! Another wonderful spot to explore is Johnsondale. The road is closed and unplowed just beyond R Ranch. If you are coming from the Northwest, there are excellent skiing access and groomed roads near Ponderosa and Quaking Aspen. 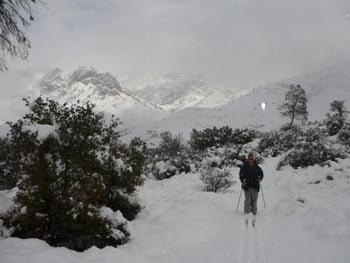 A rare snowy day on the Whiskey Flat Trail. Skiing the groomed Portuguese Pass Rd. A local secret spot. Its deep. Go find your own!